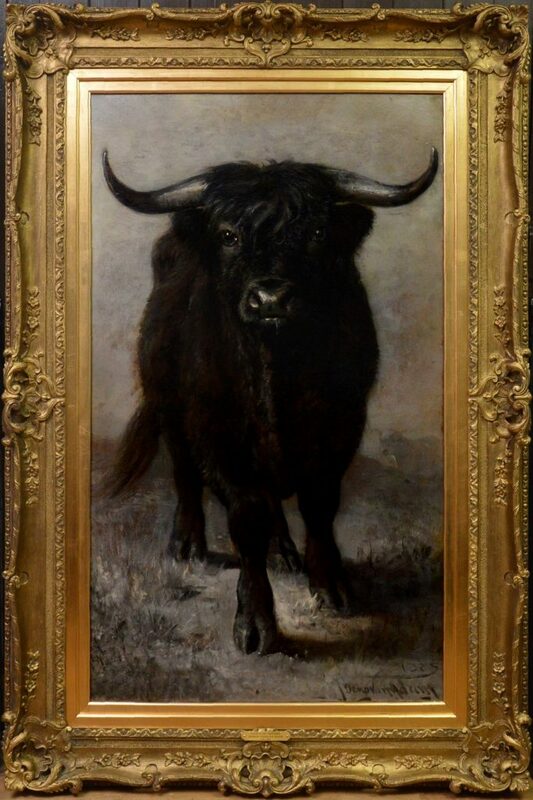 This is a very large fine 19th century oil on canvas depicting a magnificent black Highland longhorn bull by the distinguished Scottish painter Joseph Denovan Adam RSA RSW (1841-1896). 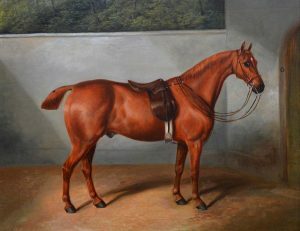 ‘Laird of the Highlands’ is signed by the artist and dated 1885. 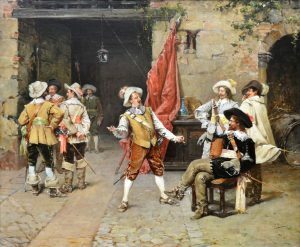 As with all of the original antique oil paintings we sell it is offered in the very finest condition it can be for its age, having just been newly professionally cleaned and re-varnished. 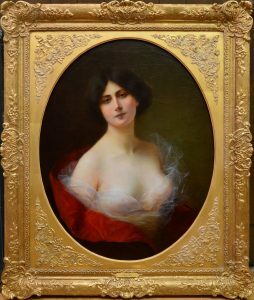 Between 1859 and 1892 Joseph Denovan exhibited 25 oils at the Royal Academy in London, as well as many more at the British Institution, the Royal Society of British Artists and the Paris Salon. 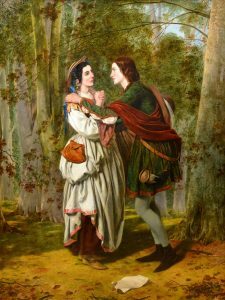 The son of the Scottish landscape painter Joseph Adam, Joseph Denovan Adam would go on to eclipse the achievements of his father becoming late Victorian Britain’s most celebrated painter of Highland cattle. Where others painters of the Highlands such as Horatio McCulloch were content to dot their landscapes with a few cattle Adam gave them pride of place. 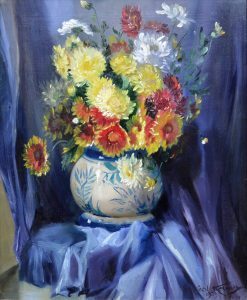 Adam was a stickler for painting from nature, and had a large studio – part wooden hut, part glass conservatory – built on his house to serve as an all-weather observation base. 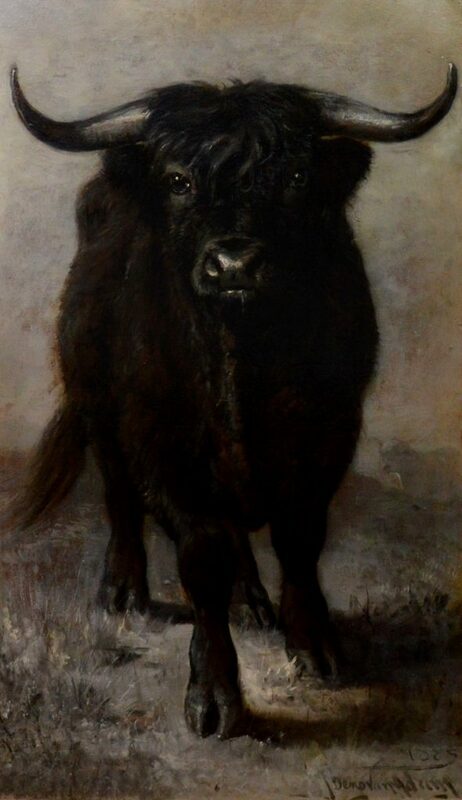 He called it his “cattle atelier”, and here he established a school of animal painting where he kept many live animals for his students to draw. Presentation: Fine 20th century Louis XV giltwood swept frame.